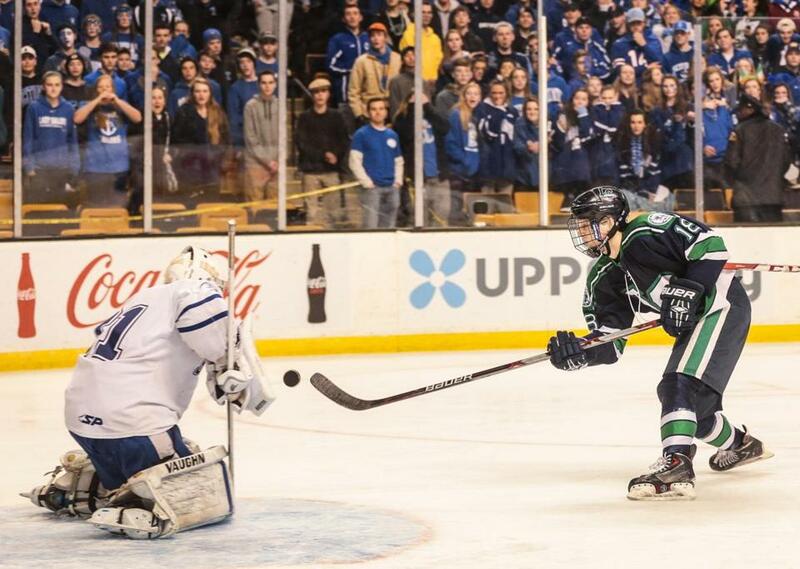 Alex Graves beats Scituate goalie Danny Santiano with the game-winning goal for Lowell Catholic in the Division 2 final at TD Garden. Alex Graves wore a white construction helmet and a wide grin as he stood outside the locker room after Lowell Catholic’s stunning 5-4 victory over Scituate in the Division 2 boys’ hockey state final at TD Garden on Sunday. The shiny white hard hat is awarded by the Crusaders to the player of the game, and Graves more than earned the right to don it. 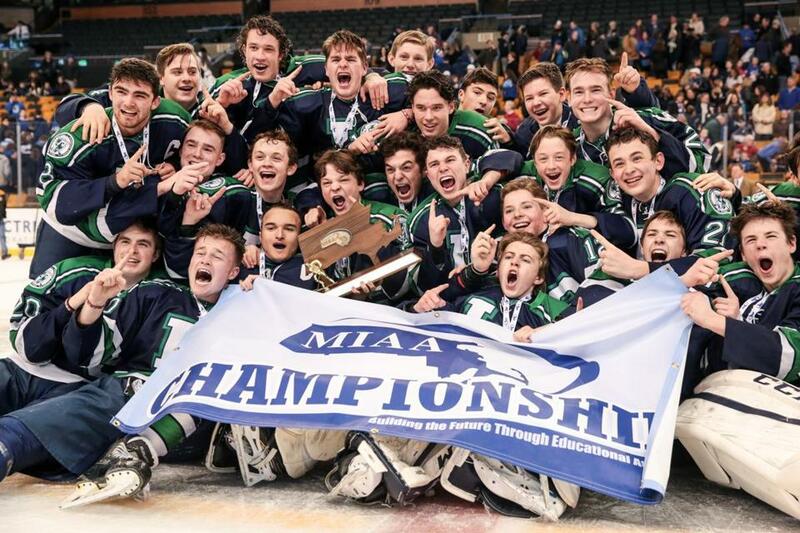 Graves, a sophomore, scored the winner off an assist from junior Nathan Donaldson with 1:06 left in the third period, delivering the program’s first state title. The Crusaders (20-2-2) entered the third period with a 3-1 lead, but the teams combined for five goals in an explosive frame. Scituate (22-2-2) tallied twice in two minutes to start the period, and tied the game after Lowell Catholic snatched a 4-3 lead with 7:20 to play. Graves led the way for Lowell Catholic with two goals, while four players lit the lamp for Scituate. “It’s the best feeling in the world,” Graves said postgame. Curran has coached the Crusaders since the program’s inception in 2008. This was Lowell Catholic’s first season competing in Division 2 after moving up a division. Curran said his team’s ability to stick to the game plan made the difference. “When it was 3-3, the way for us to win was the same way we said we had to play at the beginning of the game,” Curran said. Graves opened the scoring for the Crusaders by redirecting a slap shot from junior Mikas Kulbis-Marino to knot the game at 1-1 in the first period. The winner came with just over a minute to play, as Graves buried a one-timer from Donaldson on the glove side of Scituate goalie Danny Santiano. The Sailors came up short of their first state title since 2007. Thirteen seniors graduate this year. “Just to be here is truly an honor,” said junior Shane Comeau, who scored Scituate’s first goal. First period: 1, S, Shane Comeau (Liam Walsh) 8:34. 2, LC, Alex Graves (Mikas Kulbis-Marino) 11:15. Second period: 3, LC, Nathan Donaldson (Mikas Kulbis-Marino) 10:45. 4, LC, Mitchell Andrea (Nathan Donaldson, Connor Doherty) 12:58. Third period: 5, S, Liam Walsh (Shane Comeau) 9:03. 6, S, Ryan Loftus (Cam Francis) 11:00. 7, LC, Connor Doherty (Mitchell Andrea) 12:40. 8, S, Ben Smith 13:59. 9, LC, Alex Graves (Nathan Donaldson) 18:54. Saves: LC, Stephen D'Urso, 22; S, Danny Santiano, 24. Trophy in hand, Lowell Catholic players celebrated their 5-4 victory over Scituate for the Division 2 state title at TD Garden on Sunday. Matt MacCormack can be reached at matt.maccormack@globe.com.